VISSCHER - Comitatus Hollandiae Tabula Pluribus Locis Recens Emendata. VISSCHER, N. - Comitatus Hollandiae Tabula Pluribus Locis Recens Emendata. Comitatus Hollandiae Tabula Pluribus Locis Recens Emendata. 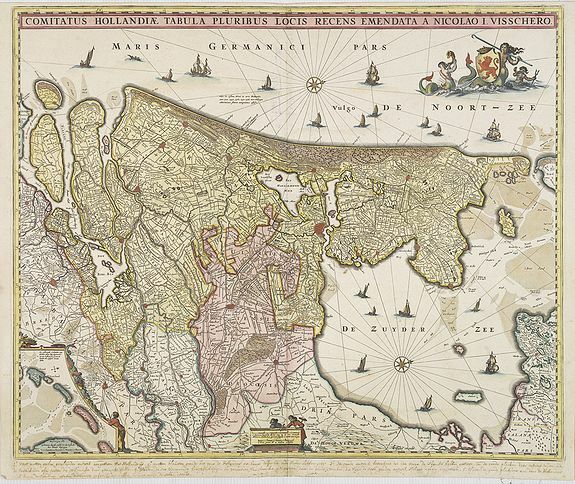 - VISSCHER, N.
Title : Comitatus Hollandiae Tabula Pluribus Locis Recens Emendata.. Description :Third state of 5) of this popular map of Holland, copied by F. de Wit, J. Danckerts and C. Allard and P. Schenk up to late in the 18th century. Bottom left corner an inset map with the islands, Texel, Vlieland and Terschelling. The first state was published in 1652. This is the third and is undated. It was Taken from the atlas Germania Inferior, sive XVII Provinciarum Geographicae generales ut et particulares tabulae. Kaert-Boeck van de XVII Nederlandtsche Provincien published by Nicolaes Visscher II which contained 21 maps of the Low Countries. Condition : Dark and good impression on thick paper. Some contemp. handwriting in Dutch in the lower margin. Repair of split lower half center fold. Center fold backed.